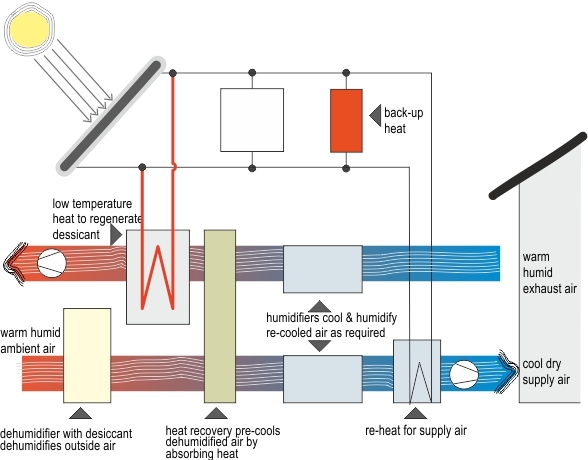 Schematic diagram of a desiccant cooling system. These systems are used in applications where the latent heat load is too high i.e. moisture content desired in supply air is minimal. Energy is saved by using the desiccant to absorb or adsorb the moisture content instead of mechanical equipment. Mechanical energy is then needed only for reducing the temperature of the air. A desiccant is a substance, either solid or liquid, which absorbs water molecules from air and dehumidifies it. The desiccant, initially used to absorb moisture from the air, is later regenerated by heating the desiccant so that it releases the absorbed moisture. This phase change cycle is a continuous process that drives the operation of desiccant systems. Open desiccant systems where desiccant comes into direct contact with the air for the process of dehumidification. Closed desiccant systems where desiccant is confined to a closed chamber and dehumidifies air indirectly. Based on the type of desiccant used, desiccant systems can be categorized as solid and liquid desiccant systems. In solid desiccant systems, a dry solid desiccant like silica gel or zeolite, is used in a rotating bed or impregnated into honeycomb-form wheel within the system. Liquid desiccant systems are a new emerging technology consisting of a contact surface, which is either a cooling coil or cooling tower, wetted with liquid desiccant like lithium chloride or calcium chloride. Desiccant systems can be successfully used in regions with low heating demand but have limited application in high humidity areas where desiccant fails to reduce the air moisture content to desired level. 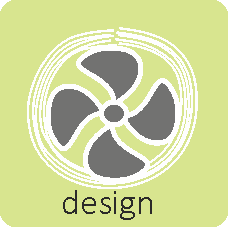 In India, no commercial project is functioning on the concept of desiccant cooling. Research projects are underway to make the application more viable. Desiccant Cooling with Solar Energy by CIBSE. An assessment of desiccant cooling and dehumidification technology by Oak Ridge National Laboratory.